I live about an hour from Greensboro, North Carolina. Nestled in between two cities, our humble, country home is pretty much in the middle of nowhere. If we want to go anywhere, it's going to be a drive, guaranteed. So, we are used to hour drives. If we want to go to Greensboro for a day, it isn't that big of a deal. We just hop in the car, and go! 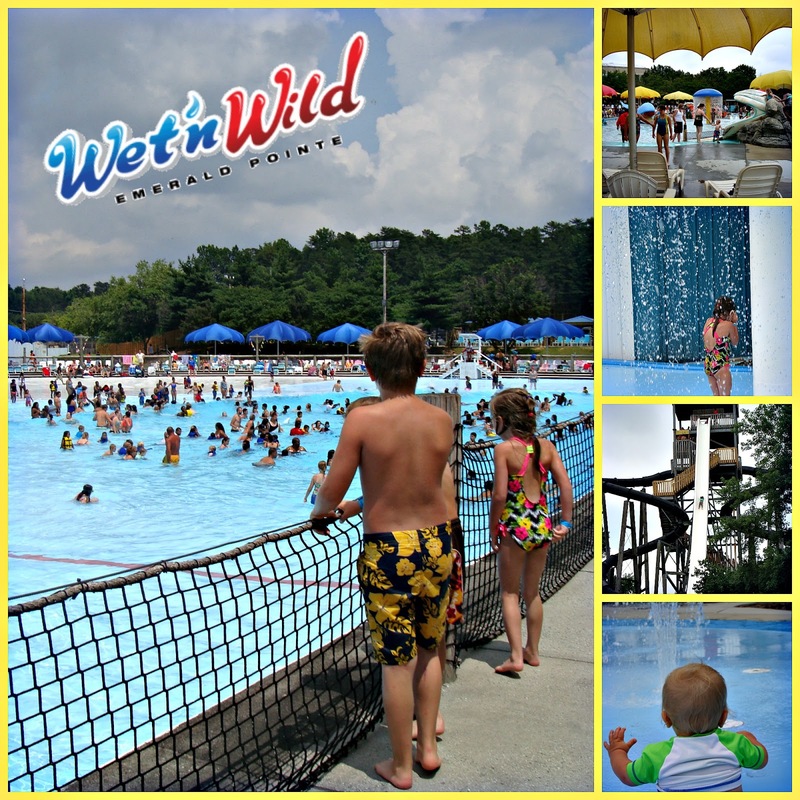 One attraction in Greensboro that we hadn't experienced yet was Wet'n Wild Emerald Pointe. I had heard about it but really knew nothing about the place. Boy, was I pleasantly surprised! Our family had the opportunity to visit recently and my kids can't stop talking about their experiences. Even days after, while sitting around the dinner table, the conversation often seems to turn to talking about that one really cool water slide or which water slide they want to go on next time! 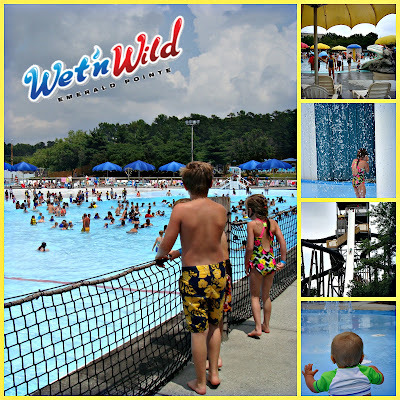 Wet'n Wild Emerald Pointe is the 12th largest water park in the US with over 36 rides and attractions. It includes a wave pool, kiddie pools, a lazy river and piles and piles of slides for swimmers of all ages. When you first arrive, your child will need to check their height. 48" and taller can ride all of the rides. If your child is this tall, then they will need a general admission ticket not the junior admission ticket. My two oldest boys were super thrilled to be tall enough to go on any slide they wanted! Fortunately, they both know how to swim, which is important since many of the larger slides end in pools that require swimming. My daughter was tall enough to go on certain adult sized slides such as the Riptide Racer and the Runaway Raft Ride. She couldn't get enough of them! For some rides, you have to be at least 42" tall to ride. Others, you have to be 45" and for others, 48." The lifeguards are extremely strict with this rule, which is good. I saw many parents have to walk their child down from the top of a slide because they thought their child could do it, but the lifeguards wouldn't let them. Speaking of lifeguards, the ones at this water park were quite efficient. While waiting for my oldest son and husband to go down the Double Barrel Blast, I observed the lifeguard in the pool at the bottom of the slides. Twice, she had to rescue swimmers who were having a difficult time. Now, it is possible that the swimmers needing to be rescued were planted there to keep the lifeguards on their toes as a part of their training, since that is a part of their continuing training, but either way- she was quick and did an amazing job! In addition to this, she was incredibly thorough in the way she looked in the water to make sure all was clear before giving the lifeguard at the top of the slide the thumbs up. After observing her, I noticed many other lifeguards watching the deeper pools were just as thorough, which made me, as a parent, feel safer taking my children here. One of the highlights of our stay was the use of a private cabana. I loved having our own, personal, shaded, space. The cabanas are set back away from the other guests which offer you a comfortable sense of privacy. Not only did we have our own table set in a shaded area, but we also had our own private lounge chairs for relaxing in the sun! The kids loved this. And for me, it was nice to have a place to go back to and kick up my heels for a bit! The park has locker rentals when you first enter but a nice amenity that the cabana has is it's own private locker. It was great to have a place to lock up our valuables while we were enjoying the attractions. One of the features of the cabana is there is a person who comes by every once in a while to see if you want to purchase any food or drink. They will take your order, go pick the food up for you and put it on your bill that you can pay for when you return the lock for your locker. One thing that you should know is that no outside food or beverage is allowed inside the park. Although, one bottled water per person is okay and for children under 2, you can bring in one small sandwich sized baggie with a snack. Also, there is a free picnic area, next to the parking lot that you can use if you do bring your own food. It was a busy day finding attractions for all four children since they were all across the board as far as age, heights and skill levels but everyone found plenty to keep them busy. They even had infant life jackets so my little one could enjoy the lazy river and wave pool with us! Heading to Wetn' Wild Emerald Pointe this summer? Use promo code THRIFTSCHOOLINGBLOG16 when purchasing tickets online or use this link! 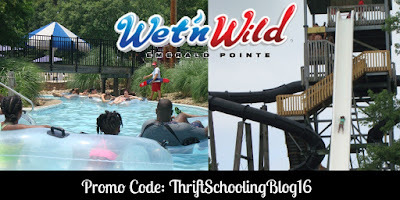 Disclaimer: This post is brought to you by Wet'n Wild Emerald Pointe. All thoughts expressed here are my own.